The power of a pointed shoe - it can make just about every ensemble look polished; even a distressed and slouchy pair of boyfriend jeans. LFF loves a pointed flat for running around town on day-to-day business - a good-quality leather pair will offer comfort without comprising on style. Pointed slippers will continue to be a key trend for fall, I love Jemima Vine's pair (2.) which combine another major AW trend - animal prints - with a sharp-toed shape. For budget options head to Zara who, in my opinion, are offering the best shoes on the high street at the moment. 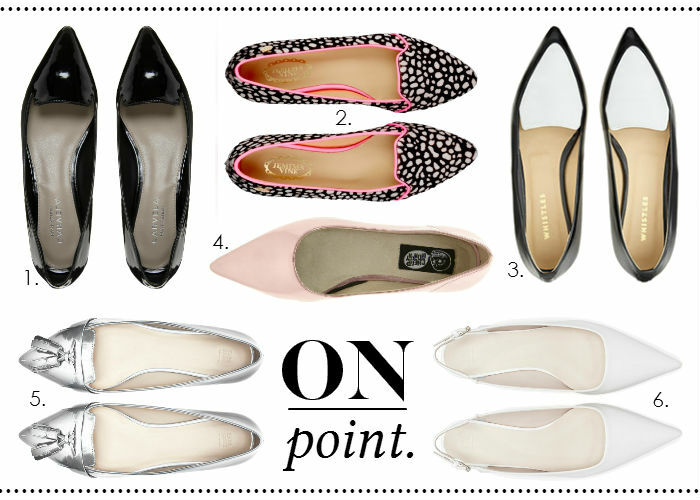 Will you be picking up a pair of pointed flats for the new season? 1. Carvela Lizzie Points, ASOS, £59. 2. Edie Neon Trim Slippers, Jemima Vine, £159. 3. Lexi Flat Pumps, Whistles, £110. 4. Cheap Monday Strawberry Pink Flats, Shopakira.com, £48. 5. Pointed Moccasin with Tassle, Zara, £25.99. 6. Pointed White Slingbacks, Zara, £39.99. They are sold out now- you obviously have a good eye! Sure they will repeat them if they know what's good for them though! Thanks for your comment as always Daniella.